This bar vanity light features encased crystals. Finished in beautiful polished chrome. A unique design to fit any dicor. This Green Matters Empire 2-Light Brushed Nickel Wall Vanity Light Fixture is an energy efficient wall sconce with alabaster glass shades that provide bright, even illumination. The brushed nickel finish makes it easy to match with many of today's popular plumbing fixtures. It comes with two 13-watt CFL bulbs. This elegant 3-light bath bar is crafted from steel and comes in a chrome finish with textured sugar glass shade. The distinctive curvature formations of the sugar glass allows this pendant to disperse an expansive light within your bathroom. Combining visual magnificence with contemporary aesthetics, this fixture is perfect for those wanting something different than the traditional bath bars. Hardware is included for easy installation. 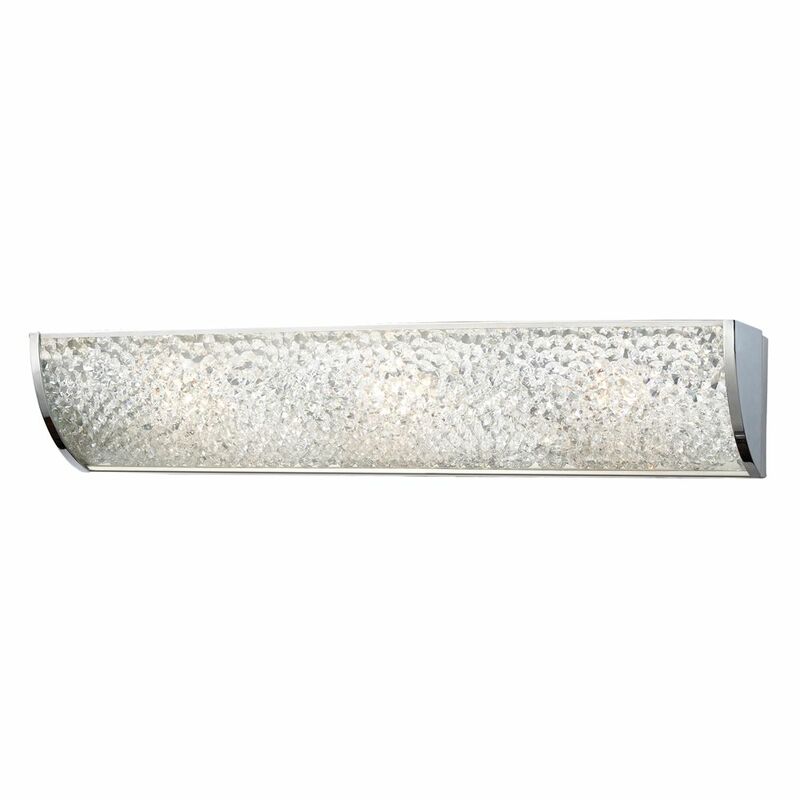 This sleek polished chrome vanity light will illuminate your bathroom with style. This 4-light wall and bath fixture has integrated LED so no bulbs to change or replace, guaranteed to last 50,000 hours and uses only 29 watts. It has a white silkscreen glass which will add a contemporary softness to any decor. Architectural style fixture features sleek polished metal endcaps with a white, acrylic diffuser. This fixture uses long-life electronic ballast for superior performance and reliability. UL Damp Location listed makes this a great fixture for use in bathrooms and powder rooms. 3-Light Wall Mount Vanity Light Fixture in Polished Chrome This bar vanity light features encased crystals. Finished in beautiful polished chrome. A unique design to fit any dicor.